In the video, Formula 1 star Alonso is playing a game on his cell phone when NASCAR ace Johnson calls him. The video plays out with footage of them both driving their respective F1 McLaren and Hendrick Chevrolet, with “TWO CHAMPIONS – TO BE CONTINUED”. On Alonso’s side, he has already announced he won’t race in Formula 1 in 2019, and has tested an IndyCar on a road course recently – with the potential for a full campaign in that series, following on from his one-off drive in the 2017 Indy 500. However, he started following NASCAR and Daytona International Speedway on Twitter recently, having already followed Johnson for some time. NASCAR’s twitter handle responded to Alonso’s tweet with a ‘pair of eyes’ emoji, and Alonso took part in the NASCAR Media Tour this year as part of the Rolex 24 at Daytona build up. On Johnson’s side, he is committed to the Hendrick Motorsports No. 48 team until 2020, although longtime sponsor Lowe’s is pulling out at the end of the season. One potential outcome would be an end-of-season car swap between the pair of them, with Johnson trying Alonso’s McLaren and vice versa. 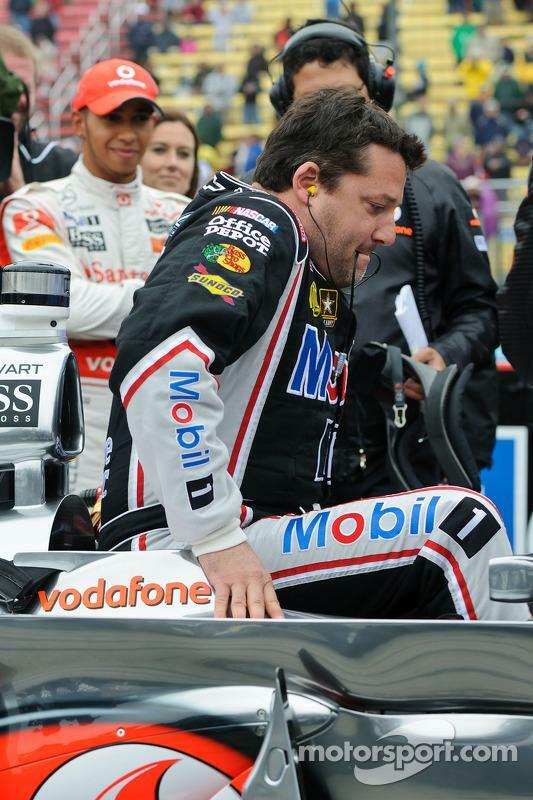 Similar F1/NASCAR examples have occurred between Lewis Hamilton and Tony Stewart at Watkins Glen in 2011 (below), and Juan Pablo Montoya and Jeff Gordon at Indianapolis in 2003.